Movement is good for you! Many people wonder about slings and exercise; can they be done safely together? parents can experience postnatally. (Read more about carrying in the postnatal period here). However, doing too much too soon can be unhelpful in the long run, for your body’s recovery from birth. Every mother’s body is different, and your level of fitness before and during pregnancy will also play a part. Pushing yourself too far too fast can play havoc with wound healing, with slower cessation of bleeding, with prolonged problems with pelvic floor issues, for example. Take your time. There is no need to spring straight back into your pre-birth activities. Don’t fall into the trap of believing that you need to “get your body back as soon as possible.” For a mother, the act of bringing life into the world is transformative: your body will never be the same again, and that is a great thing, one to be proud of! It is good to be fit and healthy, but there is a time for nurturing the new life you have brought into the world, resting and growing together, and a time for weight loss and organised fitness. 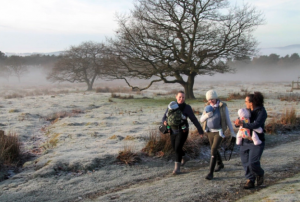 Simple walking with your baby in a comfy well-fitting carrier and spending time with friends may be all you need for the first few months, for mood lifting and gentle exercise. 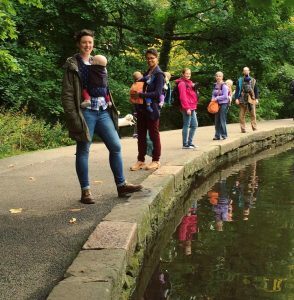 Does your local sling library organise babywearing walks, or why not start your own? If you decide you would like to join fitness or dance or any other classes that have a sling component as it seems a good option for your needs, here are some useful points to consider. This is very important. Pregnancy and birth have an impact on the core postural and abdominal muscles and the pelvic floor; it takes time for these to recover. Floors may be weak, but they can also be over-tight, both cause problems. Overloading still-recovering tissues with certain stretching or weight-bearing activities with the extra weight of a child in a sling (especially if it is poorly fitting or worn low and loose) is not wise, and may end up delaying recovery and causing more long term damage. Wide and deep squats (as opposed to narrow based with vertical shins), side lunges and jumps/bounces, for example, are all inappropriate until pelvic floor function is restored. Good posture (with aligned shoulders, pelvis/hips, knees and ankles) matters; many mothers walk with a sway back shape, out of habit or to balance weight of baby, or stand with one hip jutting out. This strains the floor and the core and needs to be addressed. Walking with a baby in the sling, ensuring good alignment and posture, gradually increasing the speed and duration, is usually enough exercise for most women in the early months. Please do not rush; pelvic floor dysfunction is very, very common (14 million women in the UK are known to have an issue, and many many more never seek help and remain undiagnosed). Leaking is NOT normal or to be expected, if you leak with a baby in a sling, on coughing or laughing, you have pelvic floor dysfunction. If you are unsure if your pelvic floor is recovering normally, please see your GP. Do you have a good carrier to keep your child safe and keep you comfortable? As with all things: your sling is never a substitute for alert responsiveness and your focus should always be on your child and their needs. A sling should hold them comfortably and safely with airway protection and neck support (ideally by appropriate seated positioning that meets the TICKS guidelines). Movements should never allow a baby to be shaken, and should always be done with their head and neck position in mind. Forward facing out carriers, especially narrow based ones, tend to encourage the baby to lean away from parent, which has an impact on parent’s posture, overcompensating for the weight by leaning back. Poor posture can lead to significant health problems. It is worth noting that many manufacturer instructions do not recommend exercising with their product; using your carrier for this purpose may invalidate any warranties. Additionally, it is unfortunate that a number of baby carriers are not as well designed as they should be, and their instruction manuals are less than ideal. Is your baby developmentally ready for this kind of activity? Parental activity should never lead to any kind of shaking for children, particularly with young babies whose heads are disproportionally heavy and whose neck muscles are still not fully developed (babies tire very easily as their muscles fatigue). Babies should not slump over in the sling during the class and should not fall asleep facing out. A good class should respect your baby’s development and not include any kind of vigorous repetitive jumping, spinning or shaking movements; your child’s safety is the main priority here. Does the instructor fill you with confidence? Does the instructor have appropriate recognised sling training to ensure your baby is kept safe in the sling at all times? It is worth checking, as it shows a good level of preparation and thought. Do they know enough about baby anatomy and development and muscle fatigue with certain positions? Will they recognise if your child has moved to a position where their airway could be compromised? Will they be able to help you correct this (especially if you are not an experienced sling user)? A good analogy might be a canoe class. If I wanted to attend a class and was required to bring my own life jacket, I might not know which was a reliable brand that would be the most likely to keep me safe. I might ask the advice of a local lifejacket expert, but equally I might buy a cheap one off the internet which has poor instructions that didn’t really show me how to keep myself safe or recognise when it wasn’t on properly. At the canoe class I would expect that my instructor would be able to give me the once over and check my lifejacket was fit for purpose and on correctly, and would indeed keep me safe, right there and then. I would expect that if my lifejacket began to slip or wasn’t in fact on properly during the class, the instructor would be able to identify that and take appropriate measures to remedy this, to keep me safe. I would expect that my instructor would be fully qualified in all aspects of the class – after all I am entrusting my safety to them. Their position of authority means I am more likely to assume that they know what they are talking about, and as a newcomer to canoe classes I will take any advice they offer about the equipment used in the class as expert (even if it isn’t). 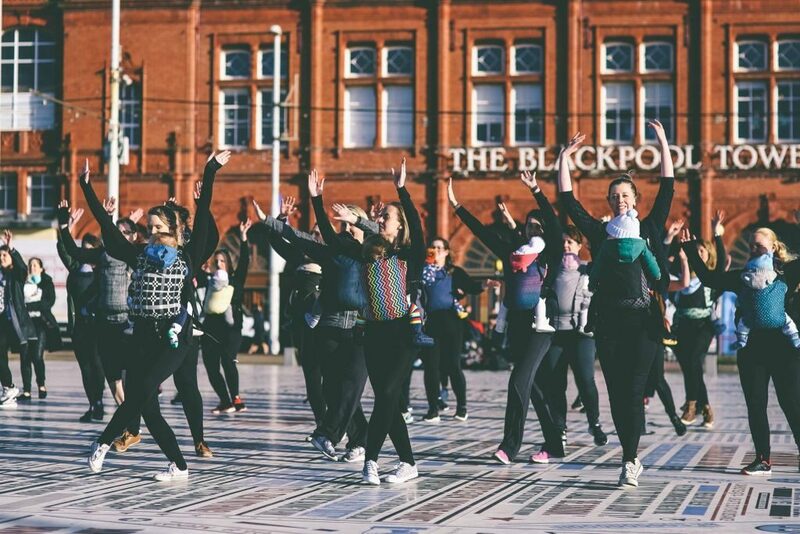 Does your instructor have appropriate qualifications to ensure your postnatal body will not be inappropriately overloaded by the extra weight of baby with the movements in the class? If they have recognised post-natal training they will be happy to share this. Do they come across as truly well researched and acting in your best interests? Are they taking your and your child’s wellbeing as seriously as you do? I feel strongly that there are many risks involved in taking part in organised classes for fitness/dance with slings. I would urge all my readers to think very carefully before getting involved with anything that has any kind of vigorous movements such as jumping, bouncing, spinning, and so on. Babies need our loving focus, care and attention; their safety must remain the first priority at all times. Your body’s recovery matters too; take your time! Do speak to your local sling librarian/consultant (Sling Pages has a list) about any classes you are considering before you go – they will be able to advise you on its suitability and help you find a sling that will work well if they feel the class is safe. There are some well-set up and well trained franchises or individual providers who do take their responsibilities towards you and your baby seriously. This post on Babywearing Exercise is extremely helpful for further reading and should be read by anyone investigating such classes. Thanks to Emma at SlingSure & Fife Sling Library for this.